Hisashi Iwakuma has been sidelined by a finger injury in camp. 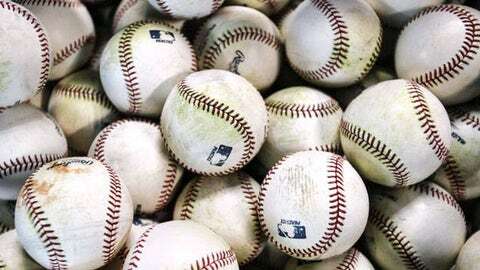 PEORIA, Ariz. — Seattle manager Lloyd McClendon said Saturday it would be "hard pressed" for either Hisashi Iwakuma or Taijuan Walker to be in the Mariners rotation on opening day because of their injury setbacks during spring training. McClendon said the injuries to Iwakuma (finger) and Walker (shoulder) will open up chances for others in camp, but also leave a rotation that had questions entering spring training even more uncertain. "I always plan for the worst and our contingency plan has been that," McClendon said. "So like I said before this gives other guys opportunities to go out and see what they can do. We’ll see what happens." Iwakuma will have his right middle finger in a splint for another three weeks before throwing, while Walker is being shut down for a week because of inflammation in his right shoulder. 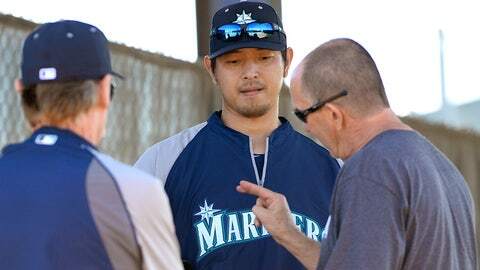 While Seattle is understandably cautious with the sore shoulder of the 21-year-old Walker because of his age, the finger injury has become frustrating for Iwakuma. When he went to see Dr. Don Sheridan on Friday, Iwakuma had the expectation that he could start throwing on Saturday. Instead, he was told to avoid throwing for three more weeks. The earliest Iwakuma is expected to pick up a ball is March 21. By the time he gets caught up on bullpen sessions and simulated games to get the needed innings to be ready for the season, it’ll likely be mid-April before he could join the Mariners rotation. "I was honestly disappointed and frustrated too at the same time, but you have to respect what the doctor says," Iwakuma said through an interpreter Saturday morning. "I was ready to play catch today so it is what it is and I have to wait three more weeks." Iwakuma went 14-6 with a 2.66 ERA in 33 starts last season and was a finalist for the AL Cy Young Award. Iwakuma reported for spring training wearing the splint and said his finger got caught as he tried to retrieve a ball in some netting while working out in Southern California on Jan. 20. McClendon also confirmed — not surprisingly — that Felix Hernandez is expected to be Seattle’s opening day starter when the Mariners open the season on March 31 against the Angels. "Unless you’ve got somebody else," McClendon joked. "I’ll try and see if he can go opening day, the second day and the third day."